You have to admire director Jim Mickle’s sense of 80s nostalgia, on full display with his latest feature Cold In July. The terrible mullets, the synthetic soundtrack, the pulpy 80s thriller vibes – imagine the films of John Carpenter mixed with the intimacy of Drive, Breaking Bad and True Detective, and you have a rough sense of what Mickle has attempted to craft here. Is it all-round perfect? Hell no. Is it entertaining and surprisingly engaging to watch? Hell yes. 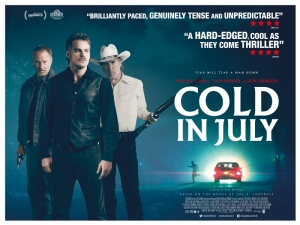 Based on author Joe R. Lansdale’s novel of the same name, Cold In July offers many twists and turns all throughout its running time and while some are less effective nor even that shocking than others, it still manages to keep you interested enough to wonder how things will turn out in the end. Will these people make it out with their lives and moral integrities intact, or shall they succumb to the dark criminal underworld they rapidly find themselves in? It keeps you hooked on the suspense, which Mickle manages to gently keep a light finger on and never lets it go fully overblown or far too predictable for audiences. The suspense is heightened further thanks to the fact that we are given plenty of time to know the three main leads, or at the very least given clues to their true personalities. Michael C. Hall, not worlds away from the world of Dexter, makes for a compelling and understandably frightened everyman, and Sam Shepard continues his understated career as a powerful character actor with his disturbed role here. But as soon as he pulls up in a smokin’ hot red Cadillac and literally enters the movie with his brow held high, Don Johnson steals the entire movie. Not only is he as fun to watch as ever in a confident and charming display of charisma, but he also has the distinction of having the most interesting character to play. With every little tidbit we learn about him at certain points, from his formal status as a pig farmer to his military service alongside Shepard’s character, he becomes more and more engaging to watch and never dull or uninteresting. There are even times when we desire an entire movie based around this one character and Johnson’s performance – it can work, there are at least two more books by Lansdale that feature the character, so get on it Hollywood! As engaging as the filmmakers try their hardest to make this film, it still doesn’t feel entirely balanced. The first half of the movie, while decent on its own, takes a more conventional step forward and sets itself up to be the typical psychological stalker thriller we’ve seen a million times over. Shepard’s character, the father of the man that Hall shot in the tantalising opening scene, starts terrorising Hall’s family including an extended and tense night invasion sequence – you’ve probably heard and seen this setup quite a few times before. But it manages to find its footing at the start of its second half, which is where the twists and turns start coming in and as a result becomes more unpredictable and engaging. The film as a whole works fine, but the way in which it’s structured makes it feel like two completely different movies in both tone and style. The consistency isn’t as strong as it wants to be, which doesn’t make it bad but more uneven in execution. Though the constant twists and turns do throw us for a loop more often than not, there are some that are not looked into enough or forgotten entirely to focus on other things. For instance, the police are seen attempting to stage the death of a major character and pass it off as an accident – that scene alone suggests there’s elements of distrust and even corruption on the force, but it’s never looked into or explained clearly why they tried to straight up kill this person. It decides to just give us abstract images of a much darker underworld our characters dive further into, instead of painting for us the whole picture. You can make the argument that it was the film’s intention to only suggest a picture of larger and more dangerous criminal activity, but there are some answers we need that the film surprisingly neglects to give us. Who WAS the man that Hall shot and killed at the very start? Why WERE the police eager to dispose of that major character amidst the grand scheme of things? What in God’s name MOTIVATED Hall’s character to keep hanging around and go further down the rabbit hole? Unfortunately, we are not given clear answers to any of these and others which haven’t been mentioned for spoiler reasons. But be honest with yourself: in a film like Cold In July where Dexter Morgan, Sonny Crocket, and Sam freakin’ Shepard go around solving mysteries and sh*t, would you even care? 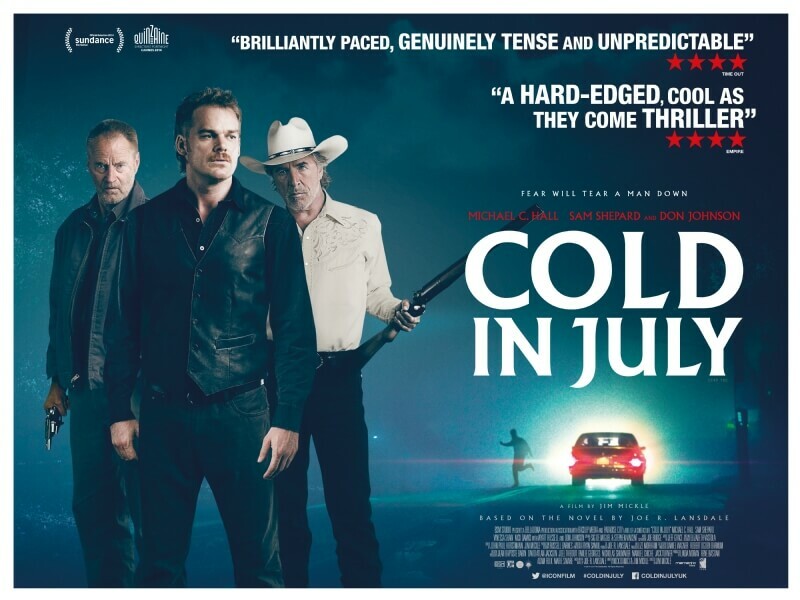 Cold In July is an engaging and thrilling genre piece, boosted by three charismatic lead performances (particularly Johnson) and 80s-style pulpy tension, which makes up for its sometimes uneven methods of storytelling.